People often ask us how to eliminate mold for good. They want to know how to clean up mold and ensure it does not grow back. That’s not an easy task. Mold can grow in places where it’s hard to find, like inside your walls and inside your heating ducts. If you miss only a few spores when you complete your clean up, mold will grow back. Ordinary cleaning products often do not kill mold, either. If you have a mold problem in your home, you need to know not only how to clean up mold but how to eliminate mold from your home for good. It’s important to understand that cleaning up household mold is not the same as doing general cleaning in your home. Ordinary cleaning products often are not sufficient and neither is chlorine bleach. There are also safety concerns since inhaling mold spores can cause significant respiratory problems and other medical problems. It’s very important to understand how to clean up mold safely. You’ll need safety gear, including an N-95 respirator mask, heavy gloves and a disposable hair cover. Wash your clothing in hot water as soon as you finish the clean up job. Hang large sheets of heavy plastic, available at hardware and home improvement stores, over open doorways and any heating ducts in the room in which you are going to be working to prevent mold spores from drifting into other areas of your home. Don’t attempt to clean up household mold yourself if you have any sort of respiratory disorder or immune system disorder. Once you feel sure you know how to clean up mold safely, you’ll need to select a suitable fungicide. You can find products designed to kill household mold at most home improvement stores. Clean the moldy area thoroughly and also clean the surrounding area with the fungicide to make sure no mold spores are left behind. It’s also important to make sure you don’t leave behind any hidden mold growing in places like inside your heating ducts or beneath your carpet. If you’re not sure whether or not you’ve located and removed all the mold, you can have a professional come in and inspect your home for you. It’s not enough to learn how to clean up mold. 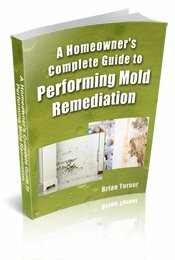 You need to know how to eliminate mold for good. That’s not as easy as it might sound. If you miss even a small bit of mold when you attempt to clean mold up, that small bit of mold can grow and spread and you’ll find yourself right back where you started. Making sure you do a thorough cleanup is important if you want to eliminate mold for good, but it’s not the only thing you need to do. Since mold typically grows in damp conditions, eliminating excess moisture in a room goes a long way towards preventing the recurrence of mold problems in the future. Check for problems like a leaky roof, any leaky pipes or any leaks around windows and repair any problems you find. If a room still seems damp, or if it has a musty odor, invest in a good dehumidifier. If you have dampness throughout your home, or at least in several areas of the home, you can purchase a whole-house dehumidifier instead of buying individual dehumidifiers for every room. Contact a mold removal specialist if you’d like more information about how to eliminate mold for good in your home. 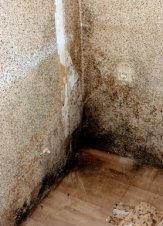 A specialist can determine what circumstances led to the growth of mold in your home and advise you about ways to prevent future mold growth. A specialist can also assist you with cleaning up mold in the home, of course, if needed. It’s recommended that you consult with a professional if you have large areas of mold or if you suspect mold inside your heating and air conditioning ducts. People with respiratory or immune system disorders should not attempt to clean up mold themselves because the cleanup process can expose you to large concentrations of mold spores, causing numerous health risks. Pregnant woman should also avoid cleaning up mold due to potential toxins. Mold removal specialists usually offer free consultations during which they inspect your home, locate all sources of mold, and advise you about the mold remediation processes recommended in your situation. Even if you plan to handle the cleanup process yourself, you can benefit from some professional advice. For a list of mold removal specialists offering free consultations in your area, just follow this link.